Perfectly Imperfect Brittany : What's Your Human Score ? Reebok has recently launched a new campaign " Be More Human " . Reebok's goal is to help individuals reach their full potential mentally , psychically , and in various social aspect of their lives . With the new campaign Reebok has also released the Human Score Test . Where you will answer various simple questions focusing on your social interactions , physical life style , wishes and etc. The results show your potential mentally , psychically and socially . 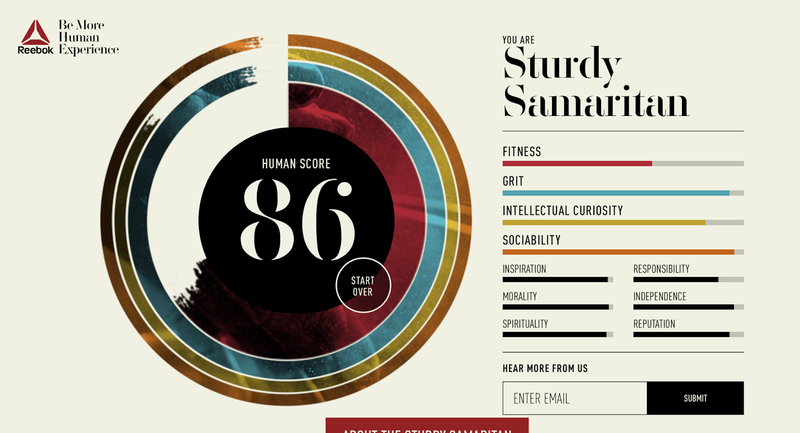 Check out my result , according to the test I am a Sturdy Samaritan . Disclosure:Perfectly Imperfect Brittany receives products in order to conduct reviews. No monetary compensation was provided unless noted otherwise. All opinions are 100% my own. Some posts may contain affiliate links that I receive commission or payment from in exchange for referrals. In the event of a giveaway, the sponsor (NOT Perfectly Imperfect Brittany ) is responsible for delivery of the prize, unless otherwise noted in the posting. I only recommend products or services I personally use and believe will be a good fit for my readers. I am disclosing this in accordance with the Federal Trade Commission's 16 CFR, Part 225: "Guides Concerning the Use of Endorsements and Testimonials in Advertising"